Check Jack's Facebook page for fairly regular status updates on new episodes! 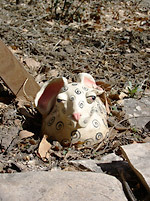 Texas Mountain Trail's Daily Photo Blog has been posting some articles about the science behind the characters of Jack. This and lots more regularly at Jack's facebook page. An unexpected revisiting of last summer's drawing theme. This and other little posts are showing up more frequently at Jack's facebook page. Wow! Fifty episodes, and it only took me seventy-five years. OK, not quite that long, and I might even add that this is my quickest turnaround for a new episode in recent memory! 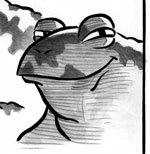 A few different stages of this smug spadefoot toad from the next episode. Here's an in-progress sketch from the upcoming episode! I also recently started a facebook page for Jack updates. If you want the latest doodles as they happen, follow me there! A while back I was asked to do a drawing of a favorite character of one of my most dedicated readers. Put your trash in a bag. 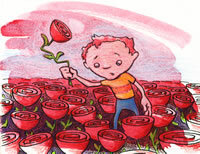 I just did a couple of 4-panel newspaper comic strips as PSA's for Keep Alpine Beautiful. Perhaps one of you will remember that once upon a time I was making this comic, and now (believe it or not!) there's a new episode. A while back I did a comic for an anthology, and it has finally arrived on the comics community site, act-i-vate. My comic is Chapter 2 of Panels for Primates. The very last roping practice dummy of the series. We're nearing the end of the parade of roping practice dummies. The "Jakesteer", from Rope-O-Matic in Marathon, TX. A really nice practice roping head that has seen better days. This one is a nicely engineered homemade roping dummy. One of the only completely headless roping dummy I found in my search. This may be the cutest -- it's definitely the simplest -- of all the roping dummies I found for my project. The cavalcade of roping practice dummies continues! Here's another practice dummy for roping. This one is homemade from around the corner. 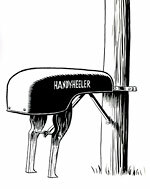 I have to admit it: instead of drawing comics, I've been drawing practice dummies for roping calves, steers and the like. There's a new Jack comic book coming up in the next month or two: a print version of Part One of the main story (check the Archive link above to see the different parts). 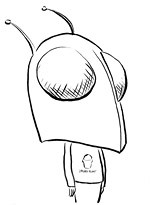 This drawing is the main title page image. 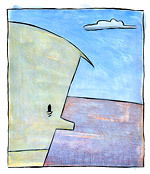 Here's another odd little non-representational ink drawing. 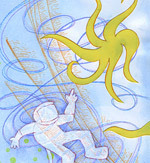 I know a lot of folks don't enjoy abstract art, but I used to make a lot of the stuff. The other night I played with applying that sort of approach to my comics-making materials. 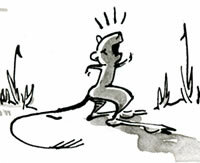 My Night of the Grasshopper Mouse mini-comic has made it through the rigorous evaluation process of the Big Bend Natural History Association, and is NOW ON THE SHELVES of the Visitor Center bookstores in Big Bend National Park! A couple of teeny drawings done on the teeny mountain behind Alpine, Texas! 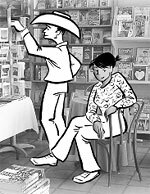 Here's an ad for Alpine's Front Street Books with a bit of cartooning in it. I'm trying to get back in the swing a little bit. Hey, check it out! a couple of new sketches! They're nothing that special, but you can't deny that they are sketches. Can you believe it? I'm not sure I can. Here is a sketch to prove it, with a brief update on the extreme lateness of the next episode. A quicky 2-panel "comic", with a quiz at the end. I got this one done more or less within a month, and I'm still trying to speed that up a bit, but I also like to post sketches and such in between the episodes. So that's my current goal: next episode in under a month, with a few extras along the way. I can't believe it! A NEW EPISODE of Jack!!! This one took me a long time, on top of being delayed by a full month while I was working on a comic for an upcoming anthology (details TBA). I have resolved to focus on moving this story forward, and will take on no new projects for the foreseeable future (excepting some further in-studio collaborative experiments). One more bit of detritus from our all too rare studio free-for-all. ALSO: The next episode of Jack is coming, just somewhat more slowly than I hoped. I'm inking it now, so hopefully it will be finished soon. A peek at the results of a play day in the studio. 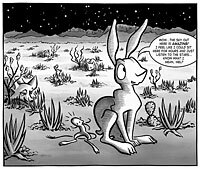 Andrew Wales just gave a really nice review of my Night of the Grasshopper Mouse mini-comic on his blog, Panel Discussion. Thanks, Andy! A Brief Report on last Friday's comic signing at Murphy St. Raspa Co.
A comics trade by mail devolves into an all-out doodle war. He started it! NEWSFLASH! Area news blog West Texas Weekly has begun "reprinting" Jack! They will be posting an episode every week, starting from the very beginning. Comic Signing Friday evening, May 8! Come down to the Murphy St. Raspa Co. and pick up a sketch and a signed copy of Night of the Grasshopper Mouse! I got some fan art! Hard to believe, but a couple of my cherished readers wasted time (that they could have spent watching TV) drawing my characters! 3-year-old Fiona Mae digs the Grasshopper Mouse. SO...I finished posting this book on my Live Journal, and now you can see the whole thing at once, or even download it as a pdf file! Jack finally has a store!! 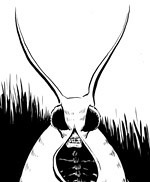 Check out the 5-page preview of my Night of the Grasshopper Mouse mini-comic! Also featuring T-shirts and original sketches! 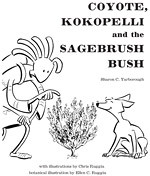 Coyote, Kokopelli and the Sagebrush Bush update! So far so good! Two days down, two pages posted. 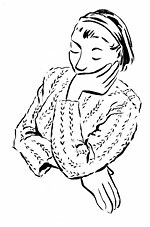 Keep checking my Live Journal for the next 10 days or so to get the whole story and see all of my irresistibly delightful illustrations! Here's a little experiment in frequent updating: at my Live Journal, I'm going to be posting all of the pages of this little book I illustrated. Tom Michael at KRTS (Marfa Public Radio) has graciously given me a file of the 20-minute interview he conducted about my comics last week! Click here to listen or download. Their Spring Pledge Drive is going on now, so be sure to become a member! MEDIA ALERT! I'm going to be on the radio! Marfa Public Radio will be interviewing me next week. Click here for the details, and a link to my tiny, tiny appearance on CNN.com (via Southern Living). AT LONG LAST! Episode 42! OK! I'm back from STAPLE, and have finally posted a report on the show. I'm almost out of the Grasshopper Mouse mini-comics, but when I get my reorder printed I will make a store page to offer them and my new t-shirts to YOU! If you're in a hurry for a shirt, send me an e-mail and I'll set you up. Read the post (which contains a photo of the t-shirt). 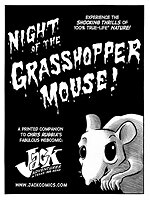 My main event for the STAPLE convention will be the debut of my first mini-comic, Night of the Grasshopper Mouse! 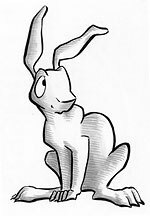 It's a 25-page all-new story featuring Jack, Mel, a Burrowing Owl, and the mysterious Grasshopper Mouse. Here's a view of the cover, and after the show I'll post some preview pages and set up a way on the site to order the comic, as well as my new Jack T-shirts! Due to my time spent prepping for the March 7 convention appearance, episode 42 is running pretty late. In the meantime, I've posted a couple more sketches, this time from news photos. A couple more sketches at the ol' Live Journal. Here's that rarest of sketches: one with some color in it! Egad! 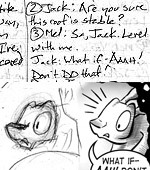 Here's the reason I missed my episode for January: a 2-page intro to Jack for the program from STAPLE 2009, a comics convention in Austin on March 7. This is the first convention I've ever attended as an exhibitor, so I'm pretty excited. 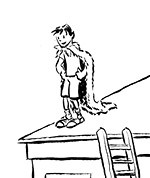 I won't have a regular episode this month, but I should be finishing up a 2-page intro comic for Jack in the next few days, and I will post that when it's done. In the meantime, here's a sketch, which has had to wait for a new scanner to arrive in the mail. Let's all bid a hearty welcome to Episode 41. 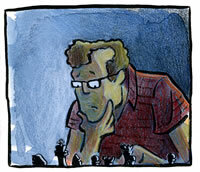 It's been a while, but I just posted a couple of new improvised sketches. A short documentary about minicomics artist Liz Billie! Plus, I ramble about our new wood stove. Obviously, not to be missed. Writing a little bit about art writing. I think Peter Schjedlahl, the New Yorker's main art writer, is fabulous. We Are Suckers for Attention. Our piece got a teeny mention in a review of the GOAL charity anthology! A little while ago we received our copy of the Irish charity anthology we contributed to, and it looks fantastic! Read the post to see some photos of the book! Some changes in the world of Jack. The upshot is that this month's episode is coming, but it will be a few days late. 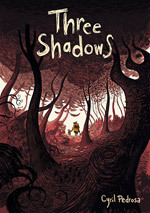 I just wrote up a review of Cyril Pedrosa's Three Shadows, from First Second Press. I can't express how much I LOVED the drawing in this book!!! I've finally finished all the drawings for the kids' coloring book I've been working on, and have posted a couple of samples. Very brief reviews and links to lengthy previews of a couple of high-quality rollicking adventures from Oni Press. 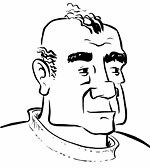 A highly skilled indie comics pro has started posting new episodes of his online strip. Talking about TV on the internet. Nothing particularly substantial, just watching TV on the internet. I'm afraid there's no Jack episode this month, but instead here's a quick 4-page comic I did as a panel-by-panel improvisation. A few more sketches for that new project. We've been watching the third season of Eureka online, and I liked the latest episode. 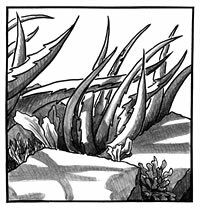 I've posted a snapshot of the six inked pages that began in late May and (with a couple episodes of Jack in the middle) were finally finished in early August. The piece will appear soon in a charity anthology. Here's a quick sketch from last night. Say hello to Episode 38, and the end of Part Two! I've finally started updating the character bios! We're starting with Jack and will continue in order of appearance until I've covered everyone. Aaargh! It's the Whedon Curse! but maybe this time I will finally learn. 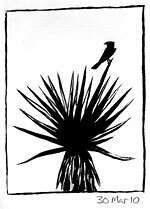 I did a couple of sketches with a new brush pen down in Big Bend National Park this week. 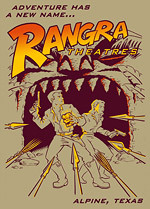 Another movie theater t-shirt design. Joss Whedon's Online Musical is streaming for free, this week only. Here's an improv sketch I did last night! The Wrong Guy is my kind of ridiculous movie. Here are some YouTube videos of funny little promos featuring Hellboy and Chuck from the NBC TV series, both of which are things that I like. 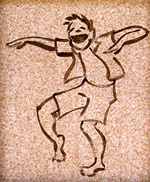 Our office windows were filled with little happy dancing people over the weekend. Inspired by a drawing challenge, here's a sketch of myself as a teenager. 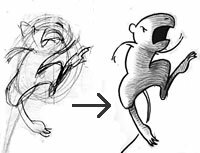 Here's a new sketch of a dancing sloth! Here's a sketch of Dog Canyon, for our last trip to Big Bend National Park! I just finished reading Sherman Alexie's The Absolutely True Diary of a Part-time Indian. For the second time. My beloved friend, Dawn Trook - poet, author, and delightfully multi-faceted artist - has a new web site! A review of a new comics version of Hamlet. My first sketch post to the Live Journal! 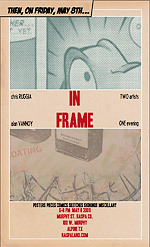 Kinds of comics: Web, SIngle-issue print, or Trade print. So, I'm mixing things up a bit. In an attempt to get Jack a little more enmeshed in the various shenanigans of the internet, I have made a new Live Journal for it. Hopefully, this will encourage me to post a bit more often as well as bringing in a few new readers down the line. I haven't quite figured out yet how I'll reflect those posts on this site, so bear with me. I do plan to put up most or all of Part 2 onto the Live Journal page over the next few weeks, but I'll at least try to link over to new posts that aren't totally redundant to what's already here. Episode 35! Episode 35! Episode 35! 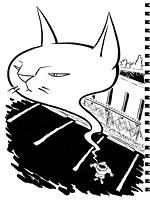 I did this drawing for a bookmark for our local bookstore quite a long time ago, but I really felt like it belonged on this site. So there. Welcome to Episode 34! I feel confident that I am solidly back on my monthly schedule. I mean, really - what could possibly go wrong? Well, you may have surmised (if you're into that kind of thing) that I won't have a new episode this month. Instead, for what it is worth, here is a little sketch. Episode 33 - Two months in the making! Action scenes are always a challenge for me (little expressive talking heads come so much more easily than full, dynamic poses), but I'm quite pleased with how this one turned out. 1 January, 2008 - HAPPY NEW YEAR! I wasn't able to complete an episode over the holidays, so I decided to go ahead and post the short piece I did last Spring for Don't Touch Me, a comics anthology guest-edited by Dalton Sharp. Episode 32, just the way you like it! A little mid-month picture! This is the artwork for a 2 color t-shirt I did earlier this year. I was quite happy with the scrollwork, and while the lettering is nothing to write all one's internet friends about, it's one of my better handmade attempts to date. Aaaah...At long, long last, Episode 30 appears. Note: If you find this episode slightly confusing, you might refer to Episode 17 for a hint. Aaargh! The embattled comic loses yet another round. Remember that "unforeseen delay" I was talking about? It came back in an even more fearsomely unstoppable form involving days of driving, hospitals, and, eventually, funeral arrangements. Sorry about the delay, but do please come back, and if you get sick of that, sign up for my mailing list and you'll know exactly when the next episode gets posted. Episode 29! After a month's unforeseen delay, the story continues. This highlights the odd time-schism between Jack's world and ours. After two and a half years of monthly episodes for us, Jack is still beginning his second evening since he met Mel and the story began, just last night. I managed to give my mailing list subscribers a heads up that I wasn't going to be able to post an episode for July, but the casual visitor would have to assume that I was 1) dead, 2) in jail, or 3) sooner or later going to apologize for not posting sooner. [ahem] I must apologize for not posting sooner. I have an excuse for missing an episode (an unusually tough deadline), but none for this further 18-day delay in passing it along to you. Injury + Insult = Business as Usual here at jackcomics.com! Y'all come back, now! Feast your comics-starved eyes on Episode 28! OK, I was wrong before: printing was delayed on the Don't Touch Me anthology, but now it's out! I have a 3-page piece in this issue, thanks to guest editor Dalton Sharp. Copies are available in, um, Toronto... but also by mail order at the DTM web site: (www.donttouchme.ca)! The 44-page magazine is $8.00, including shipping! A Link! A Link! It's been - what - a year or something since I've linked to any other comics, so I'm making up for it by linking to a whole bunch of comics at once. Lunchbox Funnies is a collective of different all-ages comics that all are of surpassingly high quality. Every one is well worth exploring. So there! Don't say I never did anything for you. I really would prefer to update a little more often than this, I assure you. I took these pictures earlier this month of some quality 3D cartooning by Alpine, Texas artist Paty Hernandez. They've been in our back yard for six years or more, and now -- for the first time -- they are unveiled to the WORLD! In other news: The issue of Don't Touch Me that contains my 3-page story has just been released!!! FINALLY -- A new episode!!! Episode 25, at your service. I have exciting news (at least, it's exciting to me...)! I've been working on a couple of side projects relating to Jack, and one of them was an invitation by guest-editor Dalton Sharp to submit a piece for the March issue of Don't Touch Me, a Canadian comics anthology magazine. I did a three-page story for the magazine, featuring an Earless Lizard and a jackrabbit that, against all the odds, looks exactly like Jack. I'll post more details when the issue comes out next month. This was a big deal for me, because although I've been making drawings and paintings for many years, I'm really pretty new to comics. The chance to participate, even a little bit, in the vibrant comics community up North means a lot to me. Thanks, Dalton! The new "Step by Step" feature is now complete! 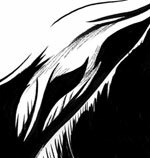 Check it out (if you like long-winded rambles about making comics...)! New "Step by Step" Feature! Well, the first half, anyway. I hope you enjoy it, assuming, of course, that this is the sort of thing you enjoy. Well, crap. I ran out of time. Again. It is my firm intent to post at least the first half of my lengthy new "Step by Step" feature sometime tomorrow, and the second half within a few days of that. So do please come back if that's something that would interest you, and have a great day! Has January been crazy for everybody, or is it just me? This is to let you know that I won't be able to post a new episode for February. I've got a hard deadline for a Jack-related comics project that has taken up all my comics work time for the month. If it comes to anything, I'll post the details then. But I DO hope to post an updated "process" feature instead of my normal episode. The one that I currently have on the Sketches & Features page is way out of date, and I took a bunch of "in-progress" pictures of Episode 15 way back in February and have never had the chance to build out that page. So I will do my best to squeeze that into the cracks of what is left of this busy month. Episode 24 is a few days early, because I won't be able to update on the first due to a server upgrade. Hope you've had a decent bit of a holiday, and here's wishing you a Happy New Year! OK, this post is not really about comics at all. You know how sometimes when a movie is made from a book, the movie kind of takes over and the book falls into obscurity? One example I've come across recently is Bambi. The book is by Felix Salten, and I'm now reading a 1931 edition of a translation by Whittaker Chambers. it was my father-in-law's when he was a kid. Until now, my sole conception of Bambi has been through Disney: I saw the movie as a child, and had a book and record of the Disney story as well. The book has a lyrical tone, somewhat like my memories of the film, but the descriptions of the sensations and emotions of the characters are so rich and complex that I have just been blown away. I expected something pretty lightweight: baby deer, cute rabbit, cute skunk, etc., but this book addresses the entire life cycle much more directly. Death isn't reserved for the off-screen gunshot here; it happens with regularity and has to be dealt with. Even the death of the leaves as Winter comes on is explored with a weirdly touching exchange as two leaves wait to fall, fully aware of their own oncoming deaths after seeing all their companions go before them. To be fair, I don't think I've seen the movie since I was a kid, and my adult perceptions are a lot more sophisticated than my childhood memories. But I've been floored by the unexpected complexities of this book. It does a phenomenal job of what I've been trying to accomplish with Jack: telling a human story about our own feelings and foibles while staying true to the lives and behaviors of the animals depicted. Part Two continues for December with Episode 23! And once you've read that, don't forget to check out my 24-hour Comic, posted a couple of days ago! PART TWO BEGINS TODAY, with Episode 22! Many thanks go out to Albert Bork for helping me so cheerfully and knowledgeably with the translation into (what I hope feels to the native speaker like genuinely casual) Spanish. And I now add to my long to-do list the production of character entries for the Long-Billed Curlew and the Badger. I know it's just a few days before the next episode gets posted, but I've been wanting to post for the last few weeks and been too busy (work, out of town, work...). 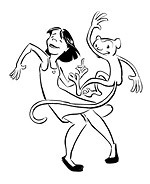 First off, here's a new link for you: Cat and Girl by Dorothy Gambrell. A lot of her strips make no sense but are funny anyway. Some of them are flat-out brilliant. Others may pass me by completely. But they all have a good-natured absurdity and a playful intelligence. Secondly, on October 7, right before we had to leave town for some family stuff, we (my wife, Ellen, and I, that is...) participated in 24-hour Comics Day! What, you may ask, is a 24-Hour Comic? Well, here's the skinny from Scott McCloud, the inventor himself. It was a surreal and unexpectedly inspirational experience for both of us, and I'll be posting my 24-hour Comic here in the next couple of weeks, as soon as I find the time to do the scanning and build those web pages. Now Showing: Episode 21, the conclusion of Part One! Long story short, I didn't think much about comics at all, much less seriously consider making them, for years. And today I want to mention two books that helped to change that. McCloud's message sunk in, but I continued painting and practicing animation for another twelve years or so before the time was finally right to get back into comics. And the second book, the one that fired me up to actually do that was a novel: Michael Chabon's The Amazing Adventures of Kavalier and Klay (NOTE: I'm linking to Amazon here for convenient reference, but be sure to buy your copy through your local independent bookseller!). Chabon's description of the feverish flood of creativity that accompanied the birth of the superhero comic just got under my skin somehow, and then that skin literally itched and crawled to be making comics. It's like my inner 3rd Grader woke up from a coma and said, "Quit Wasting Time! THIS is what you're supposed to be doing!" Gasp! Some new stuff for the sketches section! This little boxing guy is a character I came up with for an animated short I never finished. OK, OK, I never actually started it. Anyway, here are a few more poses, and even a bit of pencil animation as icing on the top. Note: Jason's work is best suited for older audiences, mainly in the sense that kids might find most of it boring. But today, there is something we get to enjoy, namely: Episode 19! Sort of. I did a picture for the cover of this month's Big Bend Gazette, the regional paper that graciously prints Jack! HOORAY! Finally, a new episode, after the longest delay since I started doing this crazy comic. Here, in all its glory, is Episode 18. Dag! I've really let this whole office-moving thing get in the way of jackcomics-fun-delivery! My apologies to any and all who've been inconvenienced by my slippage and had to resort to television to distract themselves from the yawning void of non-fun. 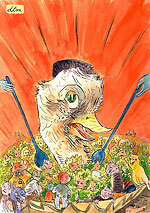 Dial K for Komics is the site of Matt Putnam-Pouliot, and it is a charmer, to say the least. Matt has a LOT of work up here, so it should help to keep you away from the TV for a considerable time, if you play your cards right. My fave is the series of bug stories, "Small Worlders." Dig around and take your time, 'cause this is some quality cuteness! I promise I'll do my best to keep things coming along smoothly from here out. Episode 18 is right on track for July 1, so be sure to come back then! Someone else's art this time, as captured from the mean streets of Alpine, Texas. Due to our having to move the office of our little design studio, I am going to be delayed in my Jack production this month. I am missing the June issue deadline on the Big Bend Gazette, and so will post my next episode to correspond with their next print date: the first of July. In a vain attempt to make up for the lack of an actual comic in June, my goal is to implement a site redesign in the interim (and now that I've told you, I really have to do it, right?). Wish me luck! Yup, you guessed it! It's Episode 17! This one was really fun for me to do. I hope you enjoy it almost as much. Hey kids! It's the April LINK-O-RAMA! This time when we spun the big clackity link-wheel, it came up with....Dean Trippe! Congratulations, Dean! 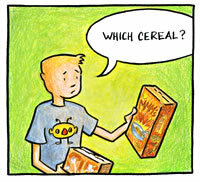 We're mostly focusing on Dean's cute-as-a-button weekly strip, Butterfly. This superhero satire started as kind of a throwaway daily as part of the Daily Grind Iron Man Challenge contest, but he's kept polishing it up as time has gone by. 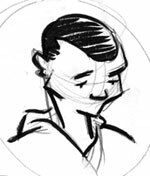 I really like Dean's drawing with its simple angular-and-curvy shapes, and his clean, pared-down inking. Go, Dean, Go! Here's a little family portrait of some of my friends! I've got an updated "process" feature in the works since I've changed my production methods quite a bit since I did this version. But I haven't pulled it together yet. So that means it's...LINK TIME! Hooray! Our lucky link this time around is the fabulous Joey Weiser. His drawing has a whole lot of charm and his writing has wit and warmth. There are a lot of short comics to look at on his Tragic Planet site, but I think the most ambitious is his current weekly work-in-progress, The Ride Home. It's been a while since I've linked to anything, mostly because I haven't been reading many new online comics lately. I've been pretty much sticking to the old standbys, all of which are listed in the sidebar on my sketches, etc. page. 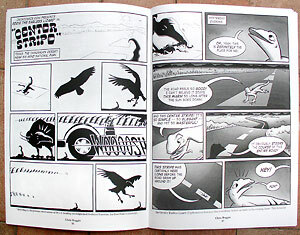 But lately Kazu Kibuishi has posted a couple of how-to's about his cartooning process that I thought I'd share: There's one on Copper, his monthly web comic, and another on Daisy Kutter, a graphic novel. I found them both very interesting, not least because the two processes he details are so different from each other. I really admire Kazu's skill; his cartooning has a lot of energy with satisfying, simple shapes, but what really blows my mind is his color work. He does incredible things with Photoshop and a Wacom tablet. Here's a dandy little extra pic. It's a t-shirt with a sort of vintage "War of the Worlds" theme I did for a partial family reunion in December. Click to see the whole thing. Episode 13 is up now and ready to enjoy, along with the celebration of ONE YEAR OF JACK! Wooo! Yow! A whole new and different comic! Here's a guest comic I did featuring Ryan Estrada's ultra-grumpy comic critic, Welton Colbert! Anyway, here's Episode 12, exactly one dollar short. Say, I know what would be fun: a new link! How about Drew Weing's site? 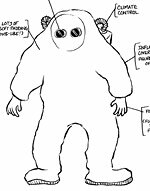 Drew is one of the few comic artists who have really made me feel miserable (with his apocalyptic piece in the thematically dismal yet accomplished You Ain't No Dancer anthology), like this is what my drawing should be like, why do I even bother? Ink never looked so good. I got over my moping in a day or so, but I still love Drew's drawing. His current project, Set to Sea, is strongly inspired by the old Thimble Theater, and it's the best kind of influence: it evokes, honors, and transcends its source material. I mean, it looks really great. A new flier with a short comic in it. Episode 11! Clicky click click. Wigu is another one of those really well-known web comics, but I'm pointing you to it anyway. This mostly-daily strip by Jeffrey Rowland is one of two comics that I check almost every day (Dalton Sharp's live journal is the other, if you were wondering). Wigu is absurd, ridiculous, even zany. It's occasionally crude. It's also incredibly good-natured and sometimes makes me laugh out loud. Yup. Episode 10. Right on time. Let me know what you think. And here's a link that will be old hat for all you regular readers of web comics, but I would be remiss if I let anyone new to that crazy world miss out on Derek Kirk Kim's Same Difference. This is the first really good comic I found on the web when I started looking around prior to starting Jack. The story telling is first-rate, the characters very human, and the drawing is in perfect pitch with the tone of the story. To me, it feels like one of those independent short films that remind you why there need to be independent short films. Here's a new little color pic. Just like I said: Episode 9 on or near the 1st of September. Enjoy! Be sure to check back next Thursday for the new episode! Here are a few color tests for a short comic that's in the works -- and will remain in the works for at least another 6 months at the rate I'm going. Sheesh. It sure has been a long time since I posted anything here. Quite a bit of family and work stuff going on, disrupting things and keeping me from working on comics, but we're still on track for the next episode on September 1. Hot Dog! Episode 8 is done! I hope it was worth the wait. Now I'm headed out of town for a couple of weeks, and will post a little something or other after we get back.I'll continue to put up links and other odds and ends until Sept. 1, and the unveiling of Episode 9 (see below for my lame excuse for another 6 week wait). So you may have noticed that Episode 8 is really taking its own sweet time in showing up. No? Well, I can pretend that you were thinking about it, anyhow. It should be up in the next week and a half, if all goes well. Episode 9 will also be about 6 weeks in coming, and should be posted on or near September 1. I know it's an absurdly long wait for all you faithful online readers, but there is a reason! I'm postponing these two episodes in order to work my way into line with the release schedule of The Big Bend Gazette, a regional, tabloid-sized monthly paper that has decided to carry Jack! Hurrah! So starting in September, each new episode will be posted at the beginning of the month when the Gazette hits the stands. Do not despair of good comics, however! I have one of the finest I've yet seen on the web to share with you:Tom Gauld's Hunter and Painter! 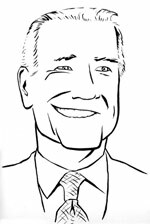 The story is friendly and fun, and the drawing is the pinnacle of simple grace. I just added a new page to the site, listing all the little extra sketches and links I've posted here since the site launched! And hot off the drawing table, here's a cute little picture---in COLOR, no less! 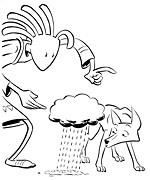 I just updated the characters page to include our new compatriots, the Coyotes. 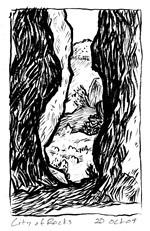 And I thought I'd link out to some great comic samples by Johanne Matte. Here are some sample pages from her great-looking Horus mini-comics, and here's a preview page from one of her pieces in the new anthology, Flight, Volume 2 (and here's the Amazon link if you want to buy it). My, what a lot of links. Hard to believe, huh? This one took the longest yet, but I don't feel too bad about it. A bit of a technique shift on this one - I used brush and ink wash to shade overall before moving on to the Photoshop toning. 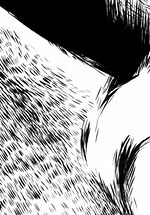 I'm happy with it - a bit more textural interest in the backgrounds, and that's always nice, right? Yup, it's been a little while since anything happened on the site here, but Episode 7 is coming along nicely. I had to work up the coyote characters in more detail, so that's slowed me down a bit. Here's a little flier I made to promote Jack around the Big Bend (click to see the whole thing). 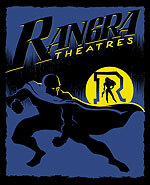 And I think I'd like to link again to Ryan Estrada's comics site. He's just a quality cartoonist with a great big heart. Here's a new Kuala Lumpur on-location comic he just posted. Episode 6! Finally! There were several delays getting started (including: a new drawing table! ), but I am pleased that when I really got into gear I made pretty good time, for what that's worth. Well, various minor upheavals have delayed Episode 6, I'm afraid. It looks like it will certainly be another couple of weeks before it's done. In other news, I've made another little "behind the scenes" feature, demonstrating the current process I'm following on episodes of Jack, if you're interested in that sort of thing. Here's a new ink wash sketch from our garden: some adorable, spiky lechuguilla! If you follow web comics at all, this one isn't news because it had a big buzz going on before it started in February. But if not, check it out. 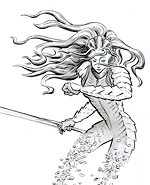 It's two stories, updated daily (MWF: "Salamander Dream" by Hope Larson, TTh: "Jellaby" by Kean Soo). Both of them are looking really good so far. I particularly like the simplicity they both bring to the drawing. Episode 5 is here! This one took 3 weeks and a day. Not the two week schedule I was hoping for, but I'm glad it's done. If you have tried to sign up for my Notify List and never received an e-mail confirmation from notifylist.com, please e-mail me and let me know. I've had some trouble with that, and will possibly start to maintain my own list if the problem doesn't get sorted out soon. Episode 5 is coming along pretty well. Looks like another couple of weeks, maybe a bit less. It's laid out, and I'm partway through the finished pencils. Here is a little "behind the scenes" sketchbook feature about the character design of Jack. Presenting Episode 4, in all its glory. Update: Episode 4 is well on its way, but will probably take another week, give or take. Here's another inkwash sketch, with a bit of color, of the Kit Fox. And if that's not enough to satisfy your craving for idle entertainments, well, I'll just have to toss you another link, to the work of Dalton Sharp. Dalton has a long (more than 100 pages now), odd, and mysterious story going called "Love is Lava" (you can find the story from the beginning in his Archive). His loose, simple line work often has an ambiguity to it that appeals to me, and he's very inventive in combining images between panels, breaking up space and time in intriguing ways. 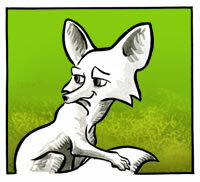 The characters page has been updated to include our new friend, the Kit Fox! And when you're done with that, check out one of my very favorite comics on the web, Jonny Crossbones by Les McClaine (the latest episode - or a link to the archive - is on the main page. Click on it to read the story from the beginning). It's a Hardy Boys kind of mystery adventure in a Tin-Tin kind of visual style, but with characters who are modern and appealing. McClaine is just a fabulous comic artist who seems to be able to draw anything and make it feel just right. He also seems to have a fixation with cartoon-ized movie monsters, if you're into that sort of thing. Geez, I almost can't believe it, but Episode 3 is done. The fourth one should come a bit quicker, but the notify e-mail list (sign up below left) is still a great bargain. Well...it looks like Episode 3 is going to be a little while in coming. It's mostly drawn -- wait, is that a lie? -- It's partly, maybe a little over half drawn, and I beat myself up daily about how long it's taking, even though I know I should be kinder to myself and affirm my value as a unique expression of the universe, the kind of pathetic universe that fails to finish Episode 3 within its arbitrarily established timeframe. Well, it looks like Episode 3 is going to be a little while in coming. It's got some action in it that's a little more complicated, drawing-wise. That being the case, I'd heartily recommend joining the Notify List (lower left on this page), so you'll be the first to know when the story continues! 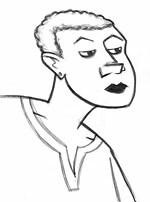 In the meantime, if you're out for comic-reading pleasure, look no further than ryanestrada.com. 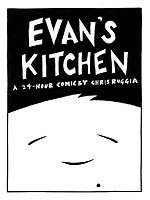 Ryan has some really sweet comics on his site, and he updates them far more often than I do. For starters I recommend this journal strip about how he wound up living in South Korea, but don't stop there! He has a lot of different short strips in a variety of styles. Plus, Ryan's been very supportive of my work so far on JACK, so go give him some traffic and if you like his stuff, buy his book. Hoorah! Episode 2 is now up! I just added a couple of little features to the site for your convenience: a simple e-mail form for sending me any comments you'd care to make, and an announcement mailing list (below on the left) that you can join if you'd like to be told when I post new episodes. I promise that's the only mail you'll get (excepting the two confirmation messages from notifylist.com), and it's not likely to clog up your in-box at the rate I'm going. I finished inking the 2nd episode last night, so now there's just the pencil shading, scanning, lettering, and photoshop shading to go! Welcome to the new site and the first episode of Jack! I hope you enjoy it. 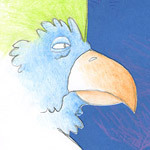 I can't promise a regular schedule for new episodes, but I'll do them as quickly as I can and post the odd sketch, illustration, or link here in between. Editor Kazu Kibuishi and the participants of the Flight anthology and web forums have done a lot to set the quality benchmark that I'm shooting for with Jack. I blame them for my having to scrap the first five episodes and undertake an entire round of character redesigns.